These Drive Through Berms are designed as a drive through option for large vehicles, machinery and other moving equipment. Built with flexible end walls, these berms allow vehicles to be driven directly over the foam portion of the berm. As the vehicle moves onto the berm, the foam wall will bounce back to reform the wall of your containment area. Please view our typical sizes for these berms listed below. *Additional Sizes and Fabric Available! Construction of these containment berms are designed to provide an easy drive through option along the end walls of the berm, while allow for complete containment along the sides. 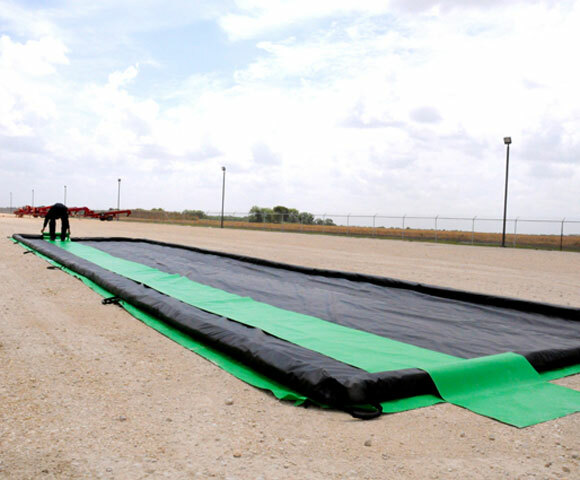 Standard design of these containment berms uses foam wall ends and air wall sides. Additional options include foam wall ends and aluminum angle sides, aluminum angle ends and foam wall sides and a berm made completely with foam walls. All fabrics used for these berms are designed with specific chemical resistances to liquids such as hydrocarbons, acids, fuel and chemicals. An MSDS may be required to help choose the best option for your liquids. 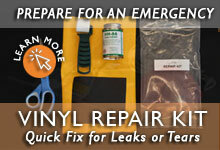 Regardless of fabric, each liner is designed for short-term contact with the intended liquid. For extended use, a different primary or secondary liner may be required.